First off, the idea of vending machines for cold beer on the street is a very intriguing idea. Add in that I can earn that beer for doing nothing, absolutely nothing for three minutes, and sir, you have my attention. Also, the vintage-looking car speedometer as a timer is very cool. Coca-Cola and their Happiness Machines may have popularized the hidden-camera, wacky vending machine trend, but others have taken it to new lengths by having people earn their treat in crazy bizarre ways. Recently, coffee company Douwe Egberts doled out free coffee at an airport in South Africa to anyone it detected yawning. Fantastic Delights’ vending machine required users to dress up like lab mice and jog on a giant wheel to earn their treat. 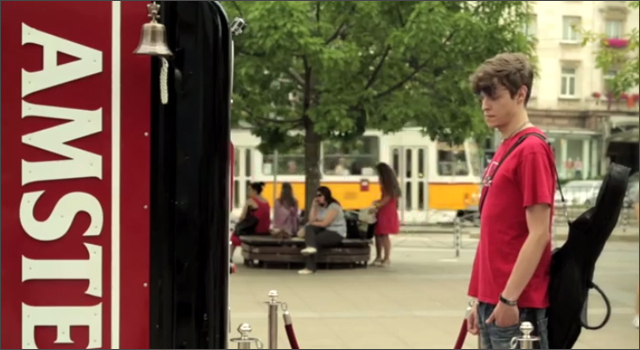 This installation for Amstel in Bulgaria requires the thirsty customer to stand still for three minutes, if they do they’re rewarded with a free beer. Dubbed Amstel Pause, the concept is to take a 3 minute pause from the busy day at the office.